A species of hairy caterpillar is believed responsible for up to a third of all abortions in Australian thoroughbreds, and scientists have moved to help owners and breeders deal with the threat. Pregnant mares that accidentally eat bag-shelter moth caterpillars, or their moulted tough outer skin, can develop equine amnionitis and fetal loss (EAFL), a disease that causes inflammation of the placental membrane. Mares that abort usually have no ill effects or evidence of illness. Such cases cost the Australian racing industry millions of dollars a year. Now, University of Queensland experts have developed an insect management strategy and guidelines for studs and farmers in an effort to reduce the risk to the industry. They are completing a risk assessment of horses’ exposure to the caterpillars. Professor Meron Zalucki, a biological sciences researcher at the university, said the caterpillars are covered with up to 2.5 million dangerous tiny hairs, and horses inadvertently ingest them or their nest remains. Zalucki says bag-shelter moth (Ochrogaster lunifer) caterpillars are commonly known as processionary caterpillars because they walk nose-to-tail in lines when they leave their nests on gum or wattle trees. The researchers have developed educational resources, including a website, a brochure and a poster with timelines for action. Processionary caterpillars nest on gum trees. Zalucki said stud owners should remove moth egg masses and caterpillar nests from tree trunks and branches and dispose of them safely. EAFL was first reported in Australia in 2004-2005, but scientists now know it has been there for many years. 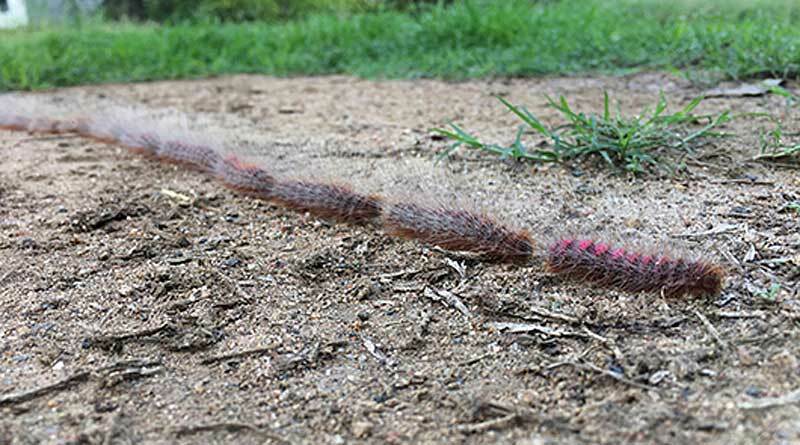 Processionary caterpillars were confirmed as the main cause in research at the University of Queensland. EAFL cases have been diagnosed as early as March and as late as September, with most cases occurring between June and August. The condition has also been implicated in cases of sick foals that are born alive at or near term and are compromised as a result of bacterial infection in the uterus. It is possible that the disease may occasionally cause other conditions, but more research is needed. The condition is similar to Mare Reproductive Loss Syndrome in the US, which caused the loss of more than 3000 foals in Kentucky in the 2001-2002 season. US researchers identified the Eastern Tent Caterpillar as the cause, which is related to its Australian counterpart. The latest research is supported with funding from the Australian Research Council and the thoroughbred breeding industry, through the Hunter Valley Equine Research Foundation. It involves researchers from the University of Queensland’s schools of Biological Sciences, Agriculture and Food Sciences, and Veterinary Science. ← The many powers of wild horses: Is it all in the genetics?